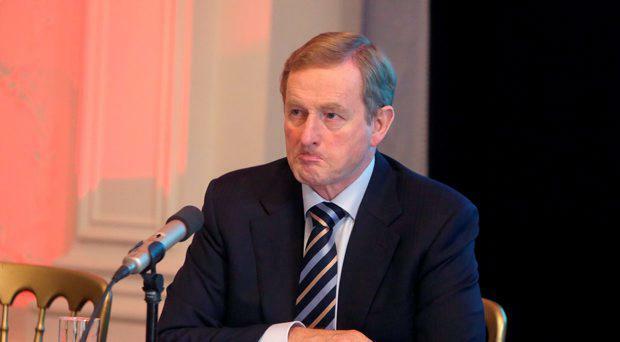 Enda was anxious to clarify the matter. He wanted absolutely no uncertainty to linger in the minds of the citizenry. It's far too serious an issue to be offering false hope to a beleaguered nation, what with an election looming. "There will be no statues to my glory or otherwise," he solemnly assured Pearse Doherty. "If that's where your interest lies, then don't talk to me please." Golly. It was akin to watching that dramatic scene in Shakespeare's 'Julius Caesar' when the Roman generalissimo thrice refuses the proffered imperial crown. The Donegal TD had come roaring out of the traps at Leaders' Questions like a ravenous hound in pursuit of a dithering rabbit. Sinn Féin had been forced to cool its collective heels for the whole week of the Dáil's well-earned mid-term recess before getting a chance to harry the Taoiseach over his revelations about the Army almost being deployed in 2012 to protect the nation's holes-in-the-walls from a panicking populace. Pearse barked and growled, keeping his question short, so that Enda couldn't disappear off down one of his customary rabbit-holes with his reply. Had Governor Patrick Honohan given him this stark warning or not? "You've given the impression that somehow within 48 hours, you thwarted disaster and saved us all from the catastrophe. Now before we start erecting statues to your glory, Taoiseach, can you finally clarify this matter for the Dáil and for citizens?" he demanded with a dollop of snark. Despite Enda's modest demurral, one couldn't help but wonder what form such a monument would take. It could be a group of figures representing the nameless hordes of Unknown Voters - all those nurses and mothers and builders and homeless people we hear of with great frequency, who tell him all their troubles at the drop of a hat. Or it could be an effigy of Himself, underpants on over his trousers and cape fastened around his neck, as the superhero known as Mayo Man dashes off to save another hapless denizen from doom. Why Enda feels the need to constantly gild lilies, tell tall tales and spin yarns is anyone's guess. Surely being Taoiseach should be sufficient to dispel anyone's insecurities. After listening to Enda's two non-answers, Pearse pithily concluded: "You're spoofing." He stopped short of accusing the Taoiseach of telling porkies - thankfully, given that pigs and prime ministers make uncomfortable political bedfellows these days. Still, Sinn Féin got its day out on the whole armoured tanks, jeeps and ATMs thing, which arrived along as a timely distraction for the party which had been getting a bit of a grilling following the release of reports from the PSNI and the gardaí over paramilitary activities on both sides of the border. But it wasn't a great Dáil outing for Labour either, with Micheál Martin even getting a laugh from the Taoiseach and his (all-Fine Gael) front bench by comparing Alan Kelly to beleaguered Chelsea manager José Mourinho: "He goes into third person and attacks the 'cowards' briefing against him." Hmm. The Special One versus Mayo Man. That can only end in tears for one of our heroes.